After the whitening gel debacle I had to buff my nails because the way it was chipping and flaking off totally wrecked them! I had layers that ripped and peeled off with it. You can still see the dents and scratches from it, awful. Since then I've chopped off most of the stained nail parts and I have also switched basecoats. I am trying Nail Life Gripper Basecoat and it's been all right so far. I don't know if it's helped prevent new staining or not but it is nice to see non orange fingernails for once lol. Sometimes I think my new basecoat makes my polish chip sooner, but then the next color I wear it lasts fine. So perhaps it's all in my mind. I used to wear Seche Base and Seche Clear for my basecoats. I think I wore those for 10 months straight. Venturing out and trying a new bc is quite adventurous for me! This was taken just a few days ago with only the Nail Life basecoat on. They look like each nail is a different length and all weird, but they are all the same! Well my pinky is a tiny bit shorter, but once I put on polish it's all even. Like an optical illusion. My nails are just as bad. Only I cut them all off super short. I broke one and cut the rest. I hate the yellow also but what can we do? The only method I have is chop the nails short and go without polish for six months. Who wants to do that? My nails look all weird and different lengths because of the whites. I'm not one of the lucky people whose free egdes are all the same length of white. I'll just stick with wearing polish. Your brave for showing your naked nails. They are a beautiful shape. Sorry to hear your nail whitening attempt caused such havoc on your nails. :( Hopefully your new base coat will help prevent future staining. I like to read your blog! I had a same problem as your stained nail before. I cahnged my base coat to Essie Protein base coat few months ago. Now my nail looks healther and whiter. I'm so happy about it. I'm also trailing my nails and photographing them naked. 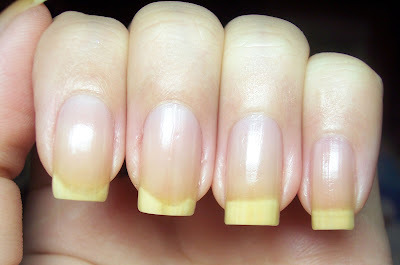 I cut them all off short and am trying nail tek foundationII. I've heard that soaking your nails in 1 tablespoons of bleach mixed with 1/3 warm water totally fixes it... Soak up to five minutes or scrub the mixture using a nail brush for one full minute.... I've not tried it myself so am curious to know if it works or not. I found that the Seche Vite Base Coat ravaged my nails too. I wore it back in the Fall for a few months and my nails were totally tattered looking. I've since switched to a Sally Hansen base coat and my nails look normal and healthy, and rarely peel natural. try those whitening tablets for dentures! it works!